Mike Trout, Bryce Harper and Giancarlo Stanton all had up-and-down starts to their MLB careers despite top prospect pedigrees. Kris Bryant may be one of baseball's most lauded young players, but as former top prospects Mike Trout and Bryce Harper will tell you, that's no guarantee for immediate MLB success. Happy Kris Bryant Day, everybody! In case you haven’t heard, the slugging third baseman will make his major league debut for the Cubs on Friday, a much anticipated event as much for his utter dominance in the minors (.327/.426/.667 with 55 home runs in 181 games) as for the Cubs’ unfortunately correct decision to start Bryant in Triple A this season due to service-time concerns. Given his ridiculous numbers, as well as his status as the second pick in the 2013 draft and as Baseball America’s No. 1 prospect coming into this season, Bryant is expected to have a huge impact right away for Chicago. However, history recommends we temper those expectations a bit. To help bring those expectations into focus, let’s look at how five of the top hitting prospects of the last five years fared upon reaching the major leagues. Since 2010, just ten other hitters have ranked in the top three of BA’s annual Top 100 prospects list. Of those nine, the Twins’ Byron Buxton (No. 2 this year) and Bryant’s Iowa teammate Addison Russell (No. 3) have yet to make their major league debuts. Two others were shortstops whose all-around ability contributed to their rankings (Jurickson Profar, No. 1 in '13; Xander Bogaerts, No. 2 in '14). Of the remaining six, one was Cardinals outfielder Oscar Taveras (No. 3 in both '13 and ’14), who was killed in a drunk driving accident in October after just 80 major league games. Trimming those five from the list leaves us with five active players who were among best pure hitting prospects of the last five years. Here’s how each did upon his introduction to the major leagues, presented in order of their debuts. The 14th pick in the 2007 draft, Heyward was BA’s top prospect entering the '10 season and a career .318/.391/.508 hitter in 1,003 minor league PA, all but 85 of them made as a teenager. Named the Braves’ starting rightfielder coming out of spring training that season, Heyward hit a three-run home run off the Cubs’ Carlos Zambrano in his first PA on Opening Day. He kept right on raking from there, hitting .301/.421/.596 with ten home runs through May 30. However, a jammed thumb suffered sliding headfirst into a base soon began to eat away at his production and his power in particular. Heyward hit just .266/.381/.396 with eight more homers over the final four months of the season, losing the Rookie of the Year award to Buster Posey. Injuries continued to take their toll on Heyward in Atlanta. Back and shoulder problems contributed to a miserable sophomore season (.227/.319/.389), and though he hit .269/.335/.479 with 27 home runs and 21 stolen bases in a healthy 2012, he missed time again in '13, losing nearly a month to an appendectomy and having his jaw fractured by a pitch in late August (he still wears a protective guard on his batting helmet). Heyward put up solid numbers in between those two fluke events, hitting .279/.365/.456, but fell short of all three of those figures in his healthy '14 season despite a conscious decision to favor making contact and getting on base over hitting for power. A second-round pick in 2007, Stanton was just 17 years and six months old when drafted out of high school. At 18, he hit 39 home runs in the Sally League, and after his age-19 season, he was the third-best prospect in baseball, according to BA. After hitting a Byrant-like .313/.442/.729 with 21 home runs in 53 games as a 20-year-old in Double A in early '10, Stanton made his debut on June 8 of that season. Stanton went 3-for-5 as the Marlins’ rightfielder in his major league debut, but made 34 plate appearances in the majors before hitting his first home run, a grand slam off the Rays’ Matt Garza. After his first 21 major league games, he was hitting just .207/.258/.317 with two home runs in 89 PA and blew hot and cold over the remainder of the season, going on a tear from early July through mid-August but cooling off thereafter to finish at .259/.326/.507 with 22 home runs in 396 PA.
From there, Stanton’s emergence as one of the game’s true superstars was steady, save for an injury-shortened 2013 campaign in which his power dipped (he hit slugged “just” .480 with 24 home runs in 116 games). But one could argue he didn't truly burst onto the scene until his near-MVP campaign in his age-24 season last year. Nonetheless, having delivered in full and then some on his prospect promise, Stanton is one of just two unqualified success stories on this list. The other unqualified success on this list is Trout. He is, of course, the guy who had the greatest rookie season of all time, hit the league as an instant superstar and has played at an MVP level since being called up at the age of 20. Except that everyone forgets about the 40 games he played in late 2011. Drafted out of a New Jersey high school two months before his 18th birthday with the 25th pick of the 2009 draft, Trout was the second-best prospect in baseball after the '10 season and third after the '11 season, by which point he had hit .338/.422/.508 in 1,219 minor league PA as a teenager. Called up directly from Double A at the age of 19, Trout made his major league debut on July 8, 2011, going 0-for-3 as the Angels’ centerfielder. Sent back down after 14 games, Trout was recalled on Aug. 19 and finally got his major league batting average over the Mendoza line on Aug. 24, his 18th major league game. He slumped again in September, however, finishing the season with a .220/.281/.390 line. The next March, Trout was laid up with the flu, which undermined his hopes of breaking camp with the Angels. But he hit the ground running in Triple A, starting the season with a 14-game hitting streak and erasing any doubts about his readiness by hitting .403/.467/.623 in his first 20 games there. Called back up on April 28—the same day Bryce Harper made his major league debut—Trout went 0-for-8 to start the 2012 season, but after doubling in his ninth at-bat, he was off to the races. By May 11, he was hitting .317/.383/.585 and hasn’t wandered far from that level of production since, which has distinguished him as one of the best young players in major league history. 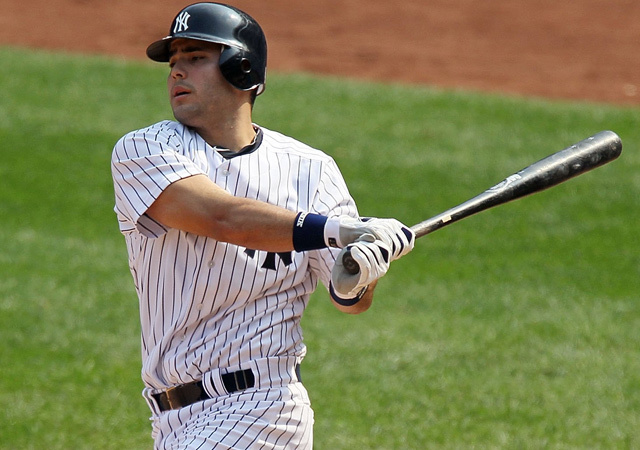 Jesus Montero was New York's No. 1 prospect before making his MLB debut in September 2011. The only hitter since 2010 to rank in the top ten of both BA's and BP’s pre-season prospect lists three years in a row, Montero ranked third on both lists prior to the '11 season and made his major league debut with the Yankees on Sept. 1 of that year, roughly three months before his 22nd birthday. A .308/.366/.501 hitter in 2,038 minor league PA to that point, Montero went 0-for-4 as New York’s designated hitter at Fenway Park in his debut, but singled in his second game, kicking off a six-game hitting streak highlighted by a 2-for-3 performance with a pair of home runs and a walk at home against the Orioles on Sept. 5. All totaled, Montero appeared in 18 games that September, starting 17 of them—14 as the Yankees’ DH—and hit .328/.406/.590 in 69 PA with four home runs. He singled in his only two at-bats in the playoffs against Detroit, driving in a run and scoring another. Impressive as that debut was, the Yankees, with Russell Martin behind the plate and Mark Teixeira at first base, didn’t have an open position for Montero, whose catching skills were viewed with considerable skepticism. That off-season, New York traded Montero and righthander Hector Noesi to the Mariners for righties Michael Pineda, who had been an All-Star as a rookie in 2011, and Jose Campos. Splitting his time between DH and catcher with the Mariners, whose home ballpark can be cruel to righthanded power hitters, Montero quickly went bust, hitting just .260/.298/.386 in '12. Remarkably, things got worse from there. After an even worse start to the 2013 season (.208/.264/.327), Montero tore the meniscus in his left knee in late May. That injury, combined with a 50-game suspension stemming from his involvement with the Biogenesis clinic, effectively ended his season. In '14, Montero showed up to camp overweight and failed to make the team. Instead, he was sent to Triple A and informed he would no longer catch. Despite his weight gain and move to first base, Montero hit well in Tacoma (.286/.350/.489), but appeared in just six major league games that season and again had his year end in disgrace. In late August, while on a rehab assignment following an oblique strain, Montero nearly came to blows with a team scout who sent him an ice cream sandwich during a game as a comment on his weight. The scout was fired and Montero was suspended for the remainder of the season. There’s still hope for Montero. Still just 25, he showed up to camp this year in excellent shape, having shed 40 pounds. Although he again failed to make the team, he is off to a great start in Triple A (.394/.444/.576 in 36 PA). Nonetheless, he stands as an example of a top hitting prospect who hit the ground running in the majors, only to trip and fall soon after. The best hitting prospect of the last five years, and one could argue over a much longer period than that, Harper was on the cover of Sports Illustrated at 16 and the top pick in the 2010 draft a year later—selected, like Stanton and Trout, well before his 18th birthday. Instantly the top prospect in baseball according to BA—a position he held until he lost his rookie status in '12—Harper made his professional debut in the Arizona Fall League in '10, raking there as well as in the full-season Sally League the next season. Despite scuffling upon a promotion to Double A in July 2011, Harper opened the '12 season in Triple A, and despite further struggles there (he hit .243/.325/.365 in 84 PA), he was called up on April 28, just six months after his 19th birthday. Harper went 1-for-3 as the Nationals’ leftfielder in his major league debut, doubling in his third at-bat, but went 61 plate appearances before hitting his first major league home run. Harper held his own thereafter with the usual ups and downs as he and the league adjusted to one another, but a strong finish (.341/.407/.690 with ten home runs in his final 141 PA) delivered him the National League Rookie of the Year award and, in combination with Trout’s simultaneous Rookie of the Year win and MVP-quality age-20 season, re-stoked expectations for Harper’s age-20 season. Harper picked up where he left off in 2013, homering twice on Opening Day and hitting .287/.386/.587 with 12 home runs through May 26, but multiple collisions with outfield walls forced him to the disabled list with knee burisits for more than a month. After his return on July 1, he hit just .266/.358/.431 with eight more home runs over 74 games. In late April of '14, a thumb injury from a head-first slide required surgery, costing Harper two months of the season and limiting his power after his return. Still, he again finished strong, hitting .305/.358/.503 with nine home runs in his final 167 PA, but this year, he's hit just .206/.325/.324. The baseball world continues to wait for the Bryce Harper we were promised: He’s still just 22 but hasn’t had a healthy season since he was a teenager and, in retrospect, might have been rushed to the majors. Harper’s slow emergence, as well as Heyward’s relatively disappointing production and Montero’s near washout, remind us that even supposed blue-chip prospects aren’t sure things, while Trout and Stanton remind us that even the ones who do reach their potential rarely do so right away. And it's not just the best of the best who struggle: Among the other top-10 hitting prospects from the last five years who just missed inclusion here are Pedro Alvarez, Domonic Brown, Eric Hosmer, Desmond Jennings, Mike Moustakas, Wil Myers, Gregory Polanco, Posey, Profar and Carlos Santana—a group from among which only Posey has emerged as one of the game’s elite players. All of which is a long way of saying that, as great a prospect as Kris Bryant may be, there’s no such thing as a sure thing.